Q: Why did the JNC settle for only 4.5% pay increase? A: It seems there is a lot of confusion regarding the rate increases in the TA. In Section 21.A [Step Rates of Pay] of the current 2014-2019 CBA, L-AS FAs are currently on contract year 3 (DOS +3) pay rates. The most recent pay increase was on 12/17/2017. We are currently scheduled for an additional 1.5% increase on 12/17/2018, which is the last increase in this contract. Q: Was there any reasoning why the JNC put out a communication for this TA a piece at a time? The first communication read raises for everyone including a hefty TFP raise for our Union Leaders. Wouldn’t you you agree that these calculations for AS were a bit misleading? They included the 1.5% raise we would receive at DOS+4 in 2018 as well as the 1.5% raise on DOS in 2019. However those two raises were already given to us under our current contract. The facts are that the extension doesn’t really give the L-AS side much of a pay increase. We were told at the Union meetings in the Spring & Fall of 2017 that “the Union had their walking papers” and “pay at the top of the scale was a priority.“ It appears that those of us on the upper end of our pay scale are again not getting a fair value assessment of the hard years we’ve given our Company. Was there any reasoning why the JNC put out a communication for this TA a piece at a time? The first communication read raises for everyone including a hefty TFP raise for our Union Leaders. The JNC put out a communication for the TA a piece at a time because we were developing content and reference material as we went. In other words, we didn’t have every document (e.g. TA summaries, TAs, blog posts, etc.) ready for publication when the JNC sent out the first communication on Monday, February 12th “MEC Unanimously Approves Tentative Merger Agreement for Membership Ratification.” See the JNC blog post “Flight Pay Loss (FPL) Increases for AFA Officers & MEC EAP [JCBA]” for more information about the AFA FPL increases. Wouldn’t you you agree that these calculations for AS were a bit misleading? 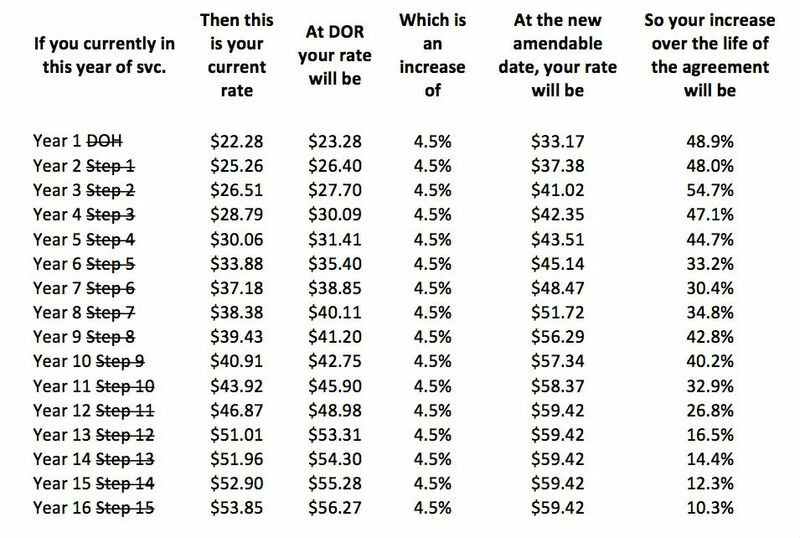 They included the 1.5% raise we would receive at DOS+4 in 2018 as well as the 1.5% raise on DOS in 2019. However those two raises were already given to us under our current contract. There was no intent to mislead anyone. It is true that the 1.5% increase scheduled for 12/17/2018 is already ‘on the books’ in the current 2014-2019 CBA, but there is no 1.5% increase in the current CBA in 2019. So it is not true that two of the raises are already given under the current contract. See the Q&A above for more info. The facts are that the extension doesn’t really give the L-AS side much of a pay increase. That really depends on one’s definition of what constitutes “much of a pay increase.” Pay increases across the life of the agreement range from ~10.4% to 54.7% when factoring in moving through the step rates of pay. See the chart in the Q&A above for more info. The other factor to consider is that this is a mid-term JCBA. L-AS FAs would not otherwise be due any pay increases other than the 1.5% scheduled for 12/17/2018 (i.e. not the 4.5% now, not the 1.5% in 2019 and not the 2.5% in 2020). We were told at the Union meetings in the Spring & Fall of 2017 that “the Union had their walking papers” and “pay at the top of the scale was a priority.“ It appears that those of us on the upper end of our pay scale are again not getting a fair value assessment of the hard years we’ve given our Company. Pay at the top of the scale was and still is a priority. However, there are multiple priorities in this merger, and sometimes even bargaining priorities must also be prioritized. The unfortunate reality is that management was unwilling to agree to targeted increases to the top of the scale. The JNC had to weigh that priority with the fact that a protracted merger negotiations may not be the optimal result for the membership as a whole–particularly because all L-VX FAs are hanging in the balance. See “Merger Negotiations Background” for more info about bargaining rationale.